This salad will be on my table this weekend. Sweet and nutty mâche is the centerpiece with dainty microgreens and peppery watercress thrown in for visual and gustatory pleasure. 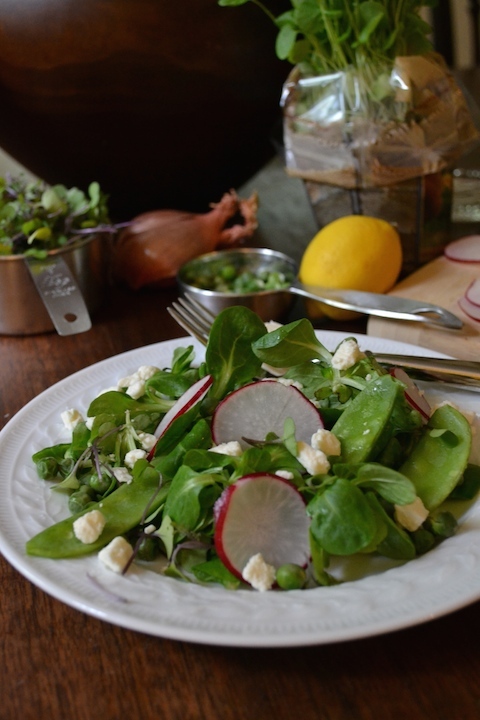 Radishes, crisp snow peas, and English peas peek out like Easter eggs on a spring morning and crumbled feta provides a salty finishing touch. The walnut oil grounds the salad with its earthy flavor and lemon juice and zest balance the vinaigrette with brilliant zing. And if all that weren’t enough to get this salad on your table, may I add that it is gorgeous. Warmer weather tends to get us all salivating over the summer tastes to come, but don’t rush to get squash and zucchini on the grill and overlook spring’s bounty in the process. I’m always shocked that delicate asparagus, sugar snap peas, and tender lettuce, among other spring produce, are the first vegetables to emerge from winter’s grasp. While they pack big flavor, they seem too dainty to do battle with the ups-and-downs of early spring weather and their emergence from the ground seems as miraculous as the arrival of spring after a long, cold winter. When preparing this salad, seek out the very best ingredients. Chill the salad plates before serving and assemble the salad right before you plan to eat it to keep everything fresh and vibrant. Don’t omit the lemon zest in the vinaigrette as it perks up the entire salad and while walnut oil is expensive, I think its flavor here is worth the expense. It certainly won’t go to waste as I plan to drizzle my leftover lemon-walnut vinaigrette over steamed asparagus later this week as I celebrate all that spring has to offer my table. Happy cooking. The ingredients for the salad can be tossed together in a large bowl with the dressing. However, for the best presentation, I recommend assembling the salad on the plate as described below and serving the dressing on the side. When it comes to assembling or tossing a salad your own two hands are the ultimate utensils. I keep latex gloves around my kitchen for just this reason. It’s good kitchen sanitation and makes plating salads for a crowd a breeze. Cook the peas in boiling water until tender (about 5 minutes for fresh or 2 minutes for frozen). Drain and then rinse under cold water. Drain again. 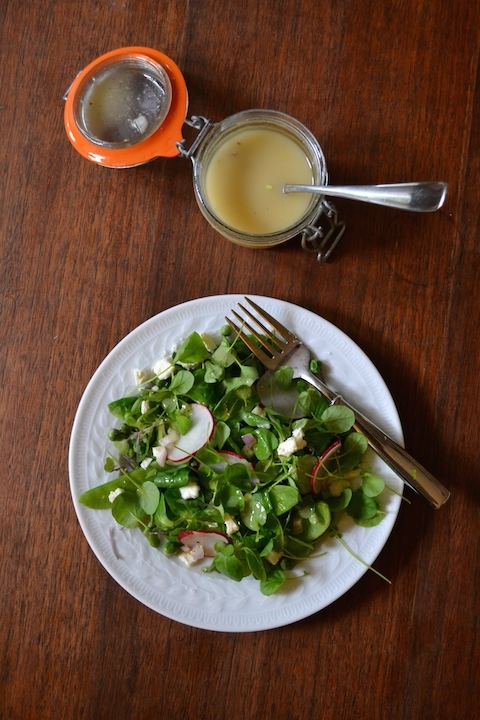 Toss the mâche, watercress, and microgreens in a large bowl. Divide the greens between the four plates. 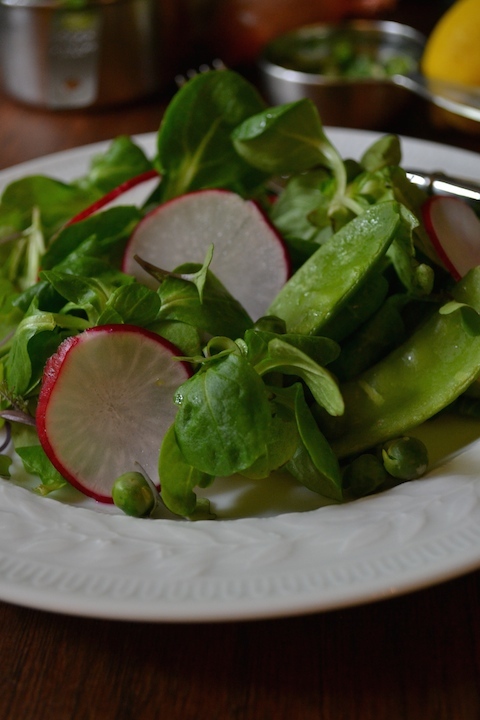 Place five snowpeas and a few slices of radish on each salad, tucking them into the greens as needed. Sprinkle the peas and feta among the salad plates. To make the vinaigrette, combine the walnut oil, lemon zest, lemon juice, shallot, and Dijon mustard in a mason jar. Add a generous pinch of sugar and salt and pepper to taste. Twist the jar closed and shake until combined. Taste and adjust the seasonings as needed. Add more lemon juice if the dressing seems too oily. If too acidic, add another pinch of sugar. Shake the dressing again right before serving and serve on the side with a ladle or spoon so guests can drizzle it over the salad. Enjoy! the seasonings as needed. Add more lemon juice if the dressing seems too oily. If too acidic, add another pinch of sugar. Shake the dressing again right before serving and serve on the side with a ladle or spoon so guests can drizzle it over the salad. Enjoy!